Any type of business activity needs to take records of the business on consistent level. It is required not only to check progress of a business but also to avoid any mistake and check fraudulent activity on financial level. Apart from that, auditing and accounting is also mandatory in most of the countries for taxation purpose. Dubai is one of the best places to setup an auditing firm due to multiple reasons. The most important reason is the presence of thousands of large and small businesses in both mainland area and several free zones. Due to availability of lucrative benefits, large numbers of companies are continuously setting up their ventures in Dubai with every passing week and month. All these corporations require services of auditing and accounting firms or professionals in order to manage their finances accurately. Apart from that, it is also mandatory on government level on these firms as well. Previously, there was almost no taxation on these businesses in Dubai and UAE. But now, 5% VAT has been applied on most of these businesses that makes it important for government as well to know complete audit report of all businesses. Both these factors are clearly providing evidence for prospects for growth of auditing and accounting firms in Dubai. In fact, present is the perfect time to setup auditing firm because of the upcoming Expo 2020 that will surely enhance business opportunities. This will ultimately result in increasing demand of auditing and accounting firms on wider scale. In order to avail these opportunities, large number of auditing and accounting firms are already providing services to their clients. But the demand of these companies is always increasing due to continuous increase in business activities in Dubai. 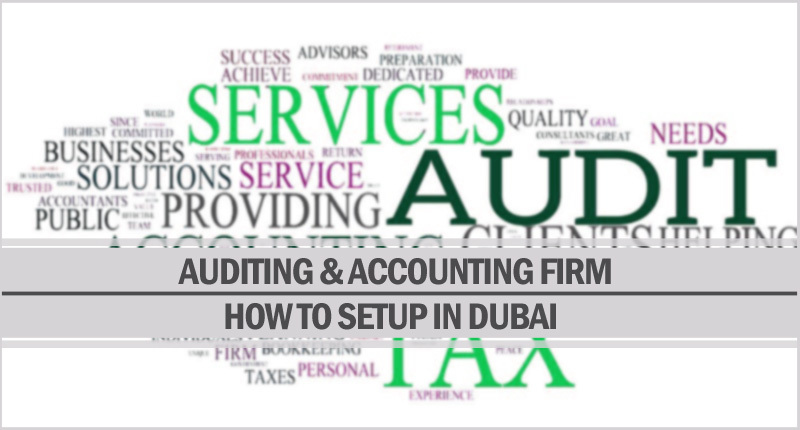 Therefore, it is beneficial to setup your auditing firm in Dubai in present as well as I future. For this purpose, you need to acquire appropriate license according to your business type and the location of your company. In this case, you need a professional license. There are several rules that must be followed to acquire auditing license in Dubai. Now, the government only issues license for accounting firms if the applicant has a bachelor’s degree or equivalent education in accounting. It is also necessary for publicly listed companies to change their auditors every four years. As full time auditors prove expensive to most of businesses, so they are most likely to outsource various auditing services to professionals and related companies. This will also ensure independent auditing of all the finances of a company. The auditing firm can be established in Dubai mainland or in any of the free zones. The procedure (concerned authority and documents) may be different in both cases. If you want to setup an auditing or accounting company, then you need specific professional license for this purpose. There are certain documents that have to be submitted for this purpose. Acquiring this license will allow a firm to practice accounting services and also to audit accounts of other corporations and firms.